This invaluable library and bookstore staple makes a great homeowner's (and shop) companion. 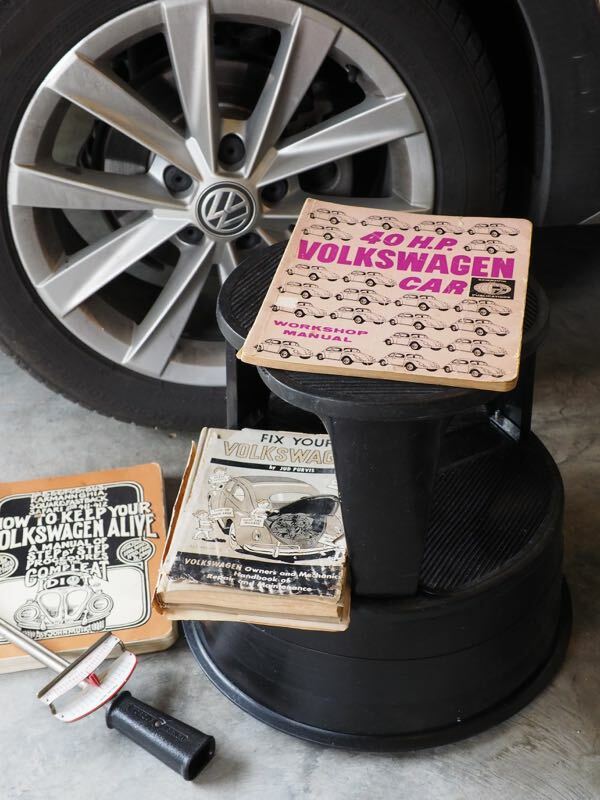 The utility of the steel Cramer Kik-Step stool resonates well with Invaluablist sensibilities. Anyone that spends time in bookstores and libraries probably already appreciates the Kik-Step's appeal as a casual tuffet. But this 50-year-plus old design offers much more versatility than just seating. The Kik-Step's wheels make all the difference. With its roll-about utility, storing it in a pantry or closet—even under a shelf—is simple and efficient. And its "kickability" makes the Kik-Step easy to maneuver, when one has full hands. And for clumsy kickers, the Kik-Step's wrap-around bumpers protect walls and furniture. The Kik-Step is rated to hold up to 350 pounds. The Cramer Kik-Step shines when dusting and cleaning. It offers extra reach for cleaning high shelves and light fixtures. It is also great for party decorating when hanging banners and such. Kik-Steps also help when hanging pictures. The Kik-Step elevates its pilot by 14 inches. The Invaluablist's Kik-Step stool is over 18 years old and looks almost new. The Cramer Kik-Step is also at home in a craft studio or light-duty workshop. What could be better for working on your car's (or "cars'") brakes? Meanwhile, combined with a bicycle work stand, the Kik-Step provides a great seating height for bicycle maintenance. These trusty stools are also helpful when working on lawnmowers and other outdoor equipment. Because of the Invaluablist antipathy for plastic, we cannot highlight the Cramer Kik-Step without pointing out that its seating and stepping surfaces are indeed molded plastic. We wish Cramer would offer a version with anti-skid tape instead of these plastic pieces, but this is a relatively minor gripe. On balance, given its great versatility otherwise, we eagerly include the Cramer Kik-Step here on the Invaluable List. The Cramer Kik-Step is a great candidate for a housewarming gift for new homeowners or new-home-dwellers. Maybe not an heirloom piece, per se, a Kik-Step should regardless provide a near lifetime of loyal, appreciated service in a loving home.